Next performances: Tonight at 8:30; tomorrow at 7:30 p.m.
the University of North Carolina School of the Arts: Walt Disney’s Fantasia. be something new with segments being added and replaced each time it was shown. that didn’t make it into the 1940 movie. animation process employed in the era before computers. of Mexican songwriter Armando Dominguez. The piece lay forgotten until Roy E.
segment of the 1948 cartoon Melody Time. accompanied by fireworks at the Bowl in 1940.
make it work. The answer is yes. Friday, August 19 and Saturday, August 20 at 8:30 p.m.
Sunday, August 21 at 7:30 p.m.
Sorcerer’s Apprentice in Walt Disney’s 1940 landmark Fantasia. 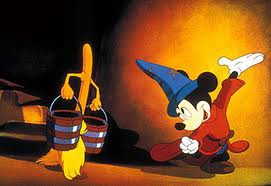 uses of that format with a program based on the 1940 Walt Disney movie Fantasia. and for its innovative melding of art and technology. the Soundtrack intermission section, and the narration by Deems Taylor. War II, torpedoed that idea during Walt’s lifetime). picture history was made last night”). the top of this post) in your mind. of being surrounded by a live symphony orchestra. of Fantasia a financial loser. experience and ultimately, it became a moneymaker for Disney.